A new National Security Agency data center is seen June 10, 2013, in Bluffdale, Utah. The center, a large data farm that is set to open in the fall of 2013, will be the largest of several interconnected NSA data centers spread throughout the country. The Pew Research survey of the NSA story, conducted from Thursday through Sunday, is the sort of irritating microdata that seems to disprove the going wisdom. The going wisdom was this: The NSA snooping scandal is leading to a civil liberties backlash. 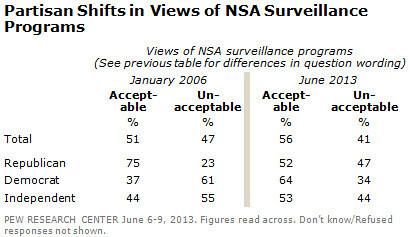 But the Pew poll, looked at in a hurry, finds tolerance for large-scale spying to be on the rise since 2006. But what about that question wording? Pew is kind enough to provide it. 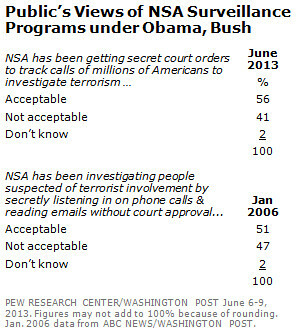 Quite a difference there, between “secret court orders” and “without court approval.” Why? Because six years ago, Your Congress responded (belatedly) to outrage over the NSA’s mid-decade snooping by amending FISA. The 2007 Protect America Act fixed the problem by redefining “electronic surveillance,” and taking most intelligence requests away from the FISA courts. You’ll notice that the bill was sponsored by Mitch McConnell, even though, by 2007, McConnell’s party no longer controlled the Senate. Good eye: The bill was passed by a rump of intelligence hawk Democrats and by all voting Republicans. Among the “nay” votes were Barack Obama and Joe Biden, both presidential candidates at the time. It’s useful to understand this when looking at the statements Democrats made in the Bush years and are making now. Whatever they thought of the revisions (and we know what Obama and Biden thought), Democrats can use them as a fig leaf to describe why their current snooping is less offensive than the snooping they opposed. And lucky for them, voters seem to believe them.